John was born in Wimborne, England, in 1927, and trained as a teacher at Winchester College. He then embarked on a 40-year teaching career that spanned four countries: England, Nigeria, Sweden and Canada. In 1961 John emigrated to Canada with his Scottish wife. They began their married life in Irvine, AB, where John taught in the high school. After four years of summer school at U of A, John had his Bachelor of Education degree, and shortly after that the family moved to BC. Two summer schools and several correspondence courses lat er, he graduated from UBC with a master’s degree in education. He was an administrator in the Shuswap School District for 21 years until retiring in 1987. Having done a year of specialized training in the teaching of geography, John was always interested in travel. In retirement he and Irene enjoyed many travel experiences and adventures and, in later years, the comfort and ease of cruising. 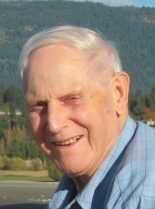 John died peacefully at home in Salmon Arm on March 28, 2017, with his family beside him. He is survived by Irene, daughter Karen, son Brian and his wife Tess, and three grandsons.